In recent years, karateka all over the world have begun to reexamine the classical kata of this ancient Okinawan self-defense system. Practical applications seem to be the order of the day in the research of many practitioners, and one of the key components of applications is the use of well-placed blows to vital areas, called kyusho in Japanese. Although there are some that seem to think that kyushojutsu is the be all and end all of all karate techniques, it is merely one part of a larger whole. Zarrilli (1992) also goes on to describe detailed "palm-leaf" texts that describe such aspects as mythological history of the art, rituals, sacred formulae, technical instructions, location of the vital spots, and treatment of injuries. This can perhaps be equated with the Fujian Bubishi that made its way to Okinawa (see McCarthy, 1995). Turning our focus to China, Sato (1996) states that the first reference to vital points in martial terms in Chinese literature can be found in the voluminous Shiji (Annals) written in the Han Dynasty. This over 1,000 year old text makes specific reference to an assassination utilizing a strike to the throat, which Sato then goes on to show, through various other linguistic references, can only be referring to a vital point strike to Renying-xue or St-9. 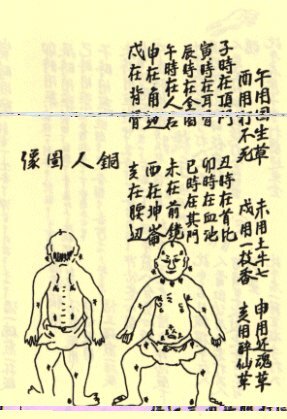 Jin (1928) gives several examples of famous Chinese martial artists who specialized in attacking the vital points, such as Zhang Sanfeng, and "Eagle Claw" Wang, who apparently had 108 striking and seizing techniques for attacking the vital areas. Several other notable Chinese martial artists who utilized the vital points in their quanfa are also mentioned by Jin. Over the years, the art of striking, seizing, or otherwise traumatizing the vital areas became obscure. This may have been through a lack of understanding on the part of teachers and students alike, or perhaps even deliberate misinformation (i.e. to keep the secrets out of one's enemy's hands). These methods eventually worked their way to Japan, through various sources, not the least of which is Chen Yuanbin (Chin Genpin in Japanese, 1587-1671) of Hangzhou, who traveled to Nagasaki and later became a retainer in the service of the Owari Daimyo in the Nagoya area (McCarthy, 1995; Muromoto, 1998). Although there is controversy as to whether or not Chen was a martial artist (Muromoto, 1998), oral tradition maintains that he taught quanfa and its associated art qinna to three people, Fukuno Shichiroemon, Miura Yojiemon, and Isogai Jirozaemon, who in turn developed their own systems of jujutsu, replete with atemi-waza or strikes to vital areas. In Okinawa, the Bubishi, commonly referred to as the "Bible of Karate" (McCarthy, 1995), seems to be one major factor in the transmission of vital point fighting. According to Tokashiki (1995), the Bubishi references both specific vital points as well as general areas that are vulnerable to trauma. A lack of written records in Okinawa karate leave us to believe that such transmission was most likely through oral and hands-on training, rather than through documentation. 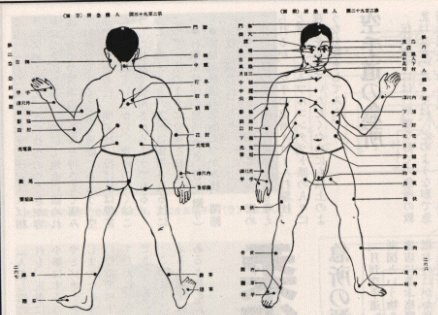 In the mokuroku (scrolls) of the Japanese fighting traditions, there are often vital point charts showing the location of the points the founder of said ryuha found to be effective. Of course initiation into the actual use of these points requires hands on instruction. However, according to a recent article in a special edition of Gekkan Karatedo (1999) outside of the Bubishi there seems to be no other examples of pressure point charts in Okinawa karate. Even Funakoshi's chart in his 1935 publication Karatedo Kyohan, does not seem to be Okinawan in origin. The same article in Gekkan Karatedo (1999) clearly states that this chart, along with the explanation of the effects, came to Funakoshi by way of his student Otsuka Hironori, 4th generation Shindo Yoshinryu Jujutsu and founder of Wadoryu Karatedo. This chart seems to be the same chart utilized in the Shindo Yoshinryu jujutsu tradition, and was a gift to Funakoshi in commemoration of the publication of this landmark book. The study of kyushojutsu has seen an upsurge as martial artists struggle to find the true meaning behind kata. The next portion of this article will deal with some of the theory behind vital point striking. Funakoshi Gichin. (1935) Karatedo Kyohan. Tokyo, Kobundo. Gekkan Karatedo ed. (1999) "Kyusho no Himitsu (The Secrets of Vital Points)." Gekkan Karatedo (Karatedo Monthly Magazine) Special Edition. McCarthy, P. (1995) Bubishi: The Bible of Karate. Tokyo: C.E. Tuttle. Muromoto, W. (1998). "The Legacy of Chin Genpin." Furyu: The Budo Journal, #8. Jin Yiming (1928). Secrets of Wudang Boxing. Translation of section on Vital Points, tr. Patrick McCarthy, 1994). Sato K. (1996). Seiden Jissen Tenketsu-jutsu. (Orthodox Dim Xue for Real Fighting) Tokyo: Baseball Magazine. Tokashiki I. (1995) Okinawa Karate Hiden Bubishi Shinshaku. (Okinawa Karate Secrets: A New Interpretation of the Bubishi). Naha, Privately Published.